The Easter Dance took place in Aegina on the Monday after Easter. The event consisted of two parts: the small and the big dance. The small dance was held at the Panagia Foritissa (St George the Catholic) square where the island's notable citizens would hold meetings. The purpose of the dance was to provide entertainment and an opportunity for young people to reveal their love interest and intention to marry. The big dance was held in the expansive courtyard of the Stavros (Holy Cross) church and the small dance would stop to allow everyone to take part in the larger one. The dancers took up positions according to their age and gender. A large circle would form around the church of Timios Stavros. The older male residents would dance first, then the unmarried and married men, then the elders again, thus forming a section of men. The women would form another section of the circle: older women, young girls, married women and older women again. The singer with his tambourine was an essential part of the Easter Dance, as he gave the orders to start the dance while the organisers ensured the correct dancer formation and the priest stood at the church door to chant "Christos Anesti" ("Christ has risen"). The Easter Dance did not rely on musical instruments, such as the violin or lute. However, if musicians happened to be there, they would be allowed to enter the circle with the singer provided the dancers agreed. The singer would then begin his song. "The dance at Paleochora was sweet as honey, because it was danced by girls like angels." The Easter Dance was also held in other villages on the island, including Anitseo, where the villagers gathered at the church and observed the service of Love (on Easter Sunday). The dance would begin and end with the setting sun, when they would set off with their animals for home. It was unique to the event that the procession would be led by the animals, with the people following on foot and chanting "Christos Anesti". The Easter Dance tradition was preserved even after the present town of Aegina was inhabited and until 1863, it was held in a square near the Mitropoli church or in the Vardia neighbourhood as it had been in Paleochora. Nowadays, the custom is revived annually in the courtyard of the Stavros church in Paleochora. 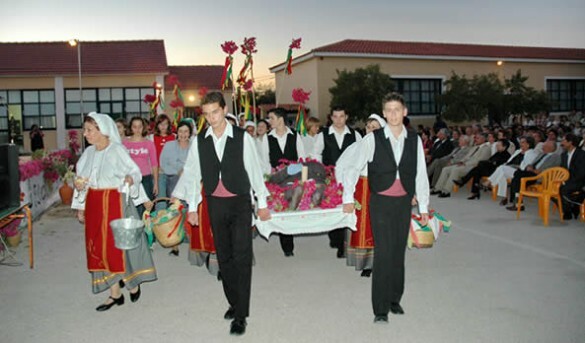 Leidinos is an old custom celebrated on the day of the Holy Cross (14 September) in Kypseli village. It is an agricultural feast with roots in pre-Hellenic worship related to the god Adonis who brings nature to life, born in spring and dying in autumn. This celebration symbolises the end of the summer farm work and the habits of the hot season, like the midday nap of the workers and the afternoon meal taken at dusk, or "Leidino", as the Aeginetans called it. It also marked the beginning of autumn and winter. Thus, the end of Leidinos is represented as a real death. Preparations begin two to three days before 14 September. The women prepare the food at home: wheat, raisins, pomegranates, almonds, chick peas and parsley. They boil the mixture, called "leidino", which resembles the grains given at memorial services. Other women make a straw-filled replica of a young man and decorate it with colourful flowers and an Aeginetan pitcher for a head. They place the effigy on a nicely laid-out table and take their places to mourn the dead Leidinos. The effigy is then placed in a coffin with plenty of flowers and carried through the streets, while flowers and boiled wheat are scattered. At sunset, they bury the dead effigy and eat the boiled wheat, dancing and singing so he will be forgiven. Three days later, they open the grave and take the dead effigy out, crying "Leidinos has risen". In the evening, they serve barley rusks, appetisers and wine and hold a celebration with traditional dances and songs. The custom is associated with the dying out of plants and the rebirth of spring. It is celebrated each year by the District of Kypseli on 14 September. Klidonas is an old custom now revived by the Cultural Association of Vathi on 24 June, the feast day of Agios Ioannis (Rizikaris). The tradition is rooted in the cleromancy (divination based on casting of lots) of the Homeric era (Ossa or Pheme), as well as the Byzantine "kleidonismos", from which it takes its name. It is a type of folk divination interpreting random words uttered. "Seal Kleidonas with the grace of Ai Giannis. Tomorrow, your 'rizikaris' will be revealed." "Open Kleidonas with the grace of Ai Giannis. Today, your 'rizikaris' will be revealed." Each verse they uttered was a prophecy for the person to whom the "rizikari" belongs and which is removed each time from the pitcher. There is another divination custom that takes place on 24 June. The young girls would take a mirror to a well and hold it to reflect the sun's rays into the water, where the face of the man they would marry appeared.